The Wye Valley and the Vale of Usk is a great holiday detination for exploring the great outdoors. From a camping holiday to a cosy cottage or B&B, there's plenty of accommodation to choose from. 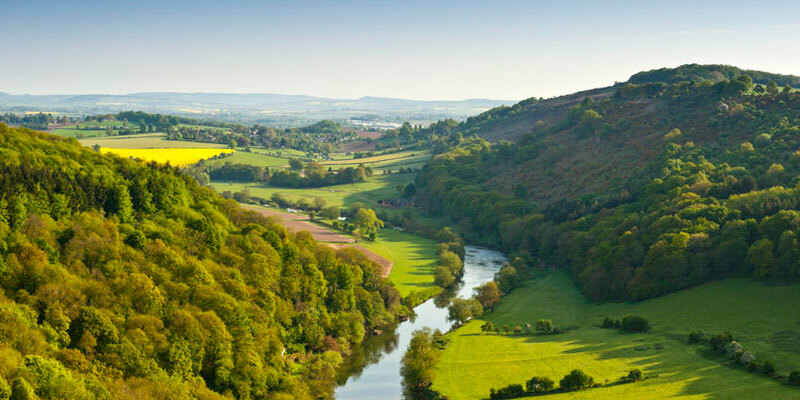 Wye Valley and the Vale of Usk sit on the Welsh borders and are dominated by two rivers, the Usk and the Wye. They meander through green vales set in rolling countryside with a selection of vineyards. Charming towns and villages and historic sites are found through out the area including Chepstow, Monmouth and Usk. In the North of the area lie the dramatic Black Mountains. The Wye Valley is designated Area of Outstanding Natural Beauty but is steeped in rich industrial heritage. The area is popular with Walkers, mountain bikers and canoeists. The small town of Usk sits on one of the best salmon fishing rivers in the country, the River Usk. Along the river why not take a refreshing riverside walk or explore the historic town with its 11th century castle, independent shops, tearooms and pubs. For families, the Wye Valley and the Vale of Usk is a fantastic natural playground for all ages to explore. Whether looking for a camping holiday, a cosy cottage, a family friendly hotel or B&B, there's plenty of accommodation to choose from. Experience perfect peace in a luxurious holiday retreat with private woodland , ponds, streams, Cider orchards, and walking trails in the rolling hills Monmouthshire Hills.